Seat(s): This Garuda Indonesia Business Class seat balances comfy with an open feeling thanks to decent seat width, a generous console and direct aisle access. It’s the width that helps more than legroom here. We were able to use the footwell to rest our feet when sitting upright so there might be some restriction if you’re taller, albiet minimal. Your seat turns into a fully-flat sleeper for long haul flights (or quick naps on shorter ones). Cushioning is good and with that decent width appears on-par with similar seats found in cabins similar to Garuda Indonesia Business Class. Tech/Connectivity/Entertainment: There are goodies like on-board wi-fi, a power outlet and a decent sized touch screen loaded with movies and a good moving map. The one unexpected surprise was live TV. Sure, it’s just a handful of sports and news channels from around the globe but a nice perk nonetheless. On our quick hop from Amsterdam to London Gatwick we werent able to access wi-fi. Maybe it wasn’t working but it’s more likely that they didn’t bother turning it on since descent began around the time we hit cruising altitude on this flight. Just a light lunch in Garuda Indonesia Business Class from AMS to LGW. In this seat, the power outlet is in kind of an awkward place as you could easily end up tripping over what’s plugged in accross from you as you exit. Food: If you’re used to flying domestic hops within the US, you’d be happy to see a saltine on a 45 minute flight. That you get a lie-flat seat and lunch? You’ll be floored. Our meal was a simple salmon plate but well prepared and beautifully presented. On longer segments you’ll get a more robust offering. 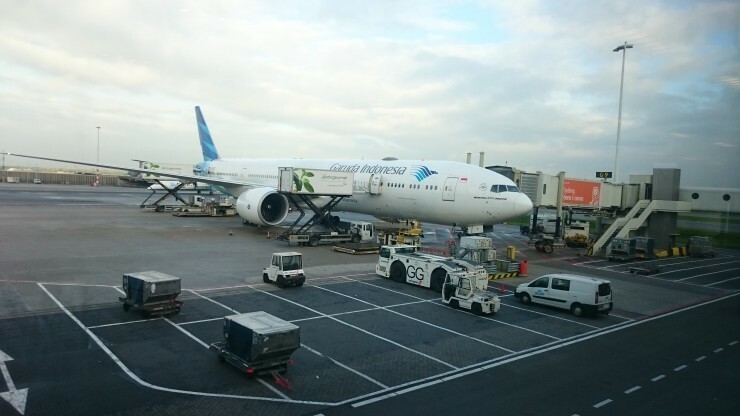 Service: A large flight crew and just 2 passengers in the forward portion of this Garuda Indonesia Business Class cabin meant unusual levels of personalized service. Regular checks on my caffine levels mixed with smiles and a very efficient meal service meant almost an entire hour of in-flight happniess. How we got em’: We paid for this one. The quick hop from Amsterdam to London Gatwick in this internationally configured Garuda Indonesia Business Class flat-bed suite is usually competitive with what British Airways or KLM will charge for their closest product. If you’ve flown European Business on BA or KLM (and most European Airlines) you know that it’s simply an Economy seat with a guaranteed open seat next to it and better-than-coach service. As a SkyTeam partner you may find availability as part of a larger international award itinerary.